Here, you’ll find a collection of current press articles and television features on DAUERFLORA. They will give you an insight into our work, the trajectory of the company and the most exciting projects we have carried out for our customers. On the TUI Mein Schiff 5 DAUERFLORA works with herbs – as a hanging wall decoration in a restaurant. The articel explains how fascinating it is to work for DAUERFLORA. It is an interesting and diversified work and does the employees proud. 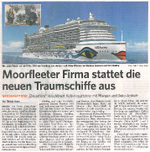 It is an international job and an impressively long list of cruise ships count on DAUERFLORA – for newbuilds and refits. 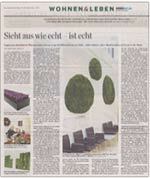 Dirk Ebeling explains in an interview with Bergedorfer Zeitung that DAUERFLORA now even provides airports with greenery. It all started with a huge McDonald’s Restaurant at Frankfurt airport and it was followed by “Hans im Glück” (comment: well-known restaurant in Germany) at Munich airport. According to Dirk Ebeling DAUERFLORA is the only provider that meets the high fire retardancy restrictions for airports. Dirk Ebeling also points out that DAUERFLORA does not only furnish airports and cruise lines with greenery and decoration but is also firmly established in the Vier- und Marschlande with regional customers and regional suppliers. Barbara Bressem explains in the interview with World Cruise Industry Review how cruise lines manage to create a fascinating ambience with tailor-made greenery decoration. She reveals what it takes to satisfy the various needs of the customers, how DAUERFLORA manages to stand out from competitors and which high standards are set today. The Hamburg-based greening specialists at DAUERFLORA have been awarded the contract for both ships that are to be launched in Japan in 2015 and 2016. 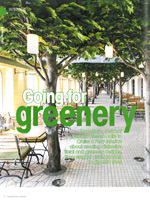 The going is good for the greening professionals on other fronts, too, according to reports in the Bergedorfer Zeitung. Open ocean cruise ships and river cruise vessels, as well as shopping centres, hotels, restaurants and homes for the elderly have ensured that commercial operations for 2013, too, have come along nicely. This is reflected as much in the fact that the number of employees has doubled over the past four years as it is in the fact that DAUERFLORA has an undertaking in Miami, USA, and has very recently started to make inroads into Abu Dhabi, UAE. The six-page English article impressively describes the process of teamwork between the greening specialists and contracting parties, designers and architects. It provides sound insight into the comprehensive planning for large-scale projects and a great deal of information on the international fresh flowers service for cruise ships and on the specifics of a fit-out incorporating live plants across a variety of climatic zones. The Hamburger Abendblatt reports on the procedure for preserving real plants, their artistic application, maintenance and long-term durability. In this context, Barbara Bressem also explains how these plants come to be used in table floral displays, wall art or other decorations by customers such as cruise ships, hotels, healthcare facilities or shopping centres. This English article explains the usage of preserved and high-value textile-based plants in beautiful floral displays that are deployed on large American yachts. Here, too, DAUERFLORA draws upon its expertise in the floristic and maritime fields when carrying out operations. 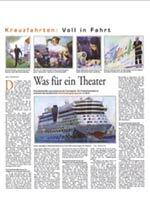 This Hamburger Abendblatt article impressively describes how the port city of Hamburg is benefiting from the cruise boom and how companies such as DAUERFLORA, the cruise ship floristry and greening specialists, are participating in this growth. 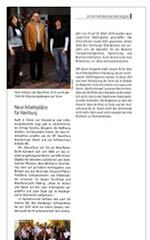 The online edition of the Hamburger Wirtschaft, issued by the Hamburg Chamber of Commerce and Industry, reports on the positive commercial development of the company DAUERFLORA International in Hamburg. The broad customer portfolio of the cruise ships, the hotel industry, shopping centres and aqua parks, combined with the favourable order profile, necessitated staff expansion.